The only two celebrity chefs I remember were Jacque Pepin and Lidia Bastianich. For his last supper, Chef Pepin wanted something that involved eggs and peas, although I may be wrong about the egg part, but I’m sure that Chef Bastianich wanted roast chicken. What was interesting to me was that each and every one of the celebrity chefs wanted a dish that they ate as a child. Me too. If I had to choose the menu for my ‘last supper’ I would also choose something that I ate as a child, and as an adult - breaded beef cutlets. There is something about a simple beef cutlet coated with breadcrumbs, parmesan cheese, parsley and garlic and fried in olive oil that tastes so delicious to me, I could eat them every day. 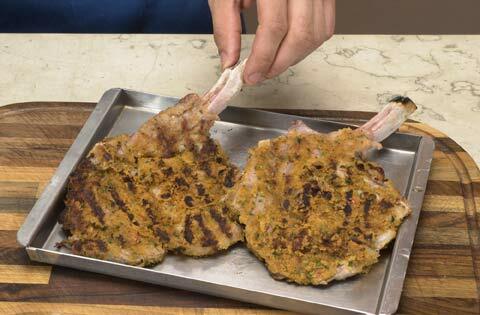 Today’s recipe, Veal Cutlet Palermo Style, is kind of like my beef cutlet, except it’s made with veal. 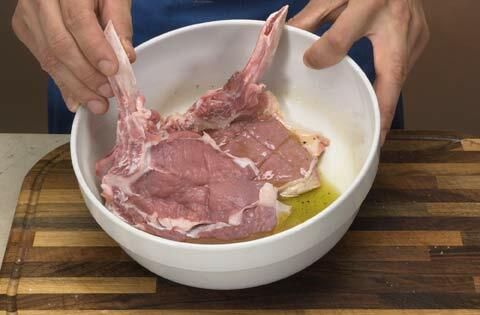 I have no idea why this veal dish is called Palermo Style, I couldn’t find any reference to Palermo having any connection to veal cutlets prepared this way in any of my Italian cookbooks or even on-line. If anyone knows anything about this recipe, would you drop me an e-mail? I would be interested in learning more about its origin. 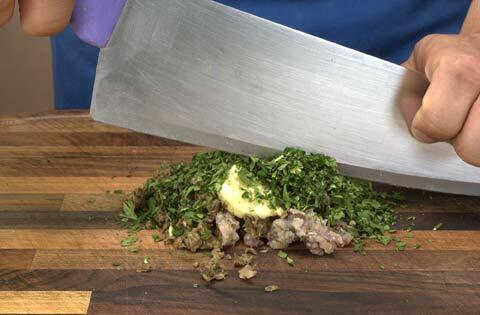 Step 1 - Finely chop the anchovies, garlic, capers and parsley and add to breadcrumbs. 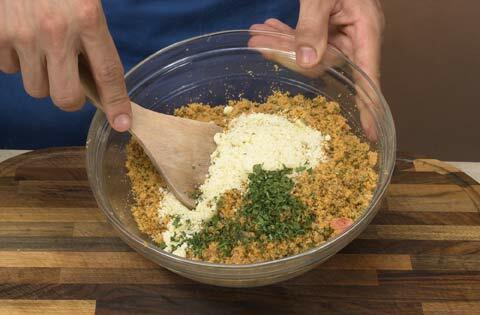 Step 2 - Add a few tablespoons of extra virgin olive oil (just enough to slightly moisten the breadcrumbs), chopped fresh tomatoes, oregano, and mix well until a rather dry mixture is obtained. Step 3 - In the meantime, marinade the cutlets in oil and lemon, a pinch of salt, pepper, for about two minutes. 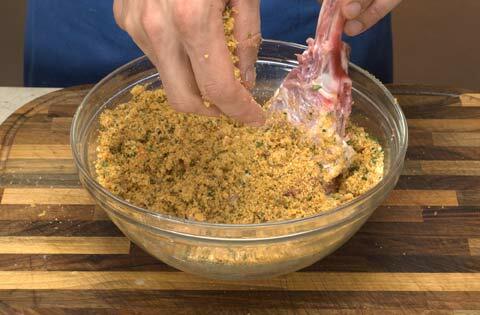 Step 4 - Drain the cutlets and bread them, making sure the breadcrumbs stick evenly. Step 5 - Brown the cutlets on a low heat grill then finish cooking them in the oven at 180°C on a greased oven tray. You need to know that the bread mixture should not be too moist, otherwise it will not stick to the meat, and the marinade should cover the cutlets completely. This adds to their tastiness.